Here is a list of things that you might want to do before you upgrade your vCenter from vCSA 6.0 to vCSA 6.5. First check you postgres database. For some reason the table owner is often wrong. Thanks to black88mx6 There is a way to check this, and also to fix it. Remember that anything you see here is executed at your own risk. An important step to perform before upgrading is taking a backup/snapshot of your vCenter VM, and any related components, so that you will be able to recover from a failed upgrade. A wise step is to use DRS rules to keep your vCSA VM to a single host so you know where to find it without vCenter. Also make sure you have a working root account for that host. /opt/vmware/vpostgres/current/bin/psql -U postgres -d VCDB -c "ALTER SEQUENCE vpx_vdevice_backing_rel_seq OWNER TO vc"
/opt/vmware/vpostgres/current/bin/psql -U postgres -d VCDB -c "ALTER SEQUENCE vpx_access_seq OWNER TO vc"
/opt/vmware/vpostgres/current/bin/psql -U postgres -d VCDB -c "ALTER SEQUENCE vpx_alarm_seq OWNER TO vc"
/opt/vmware/vpostgres/current/bin/psql -U postgres -d VCDB -c "ALTER SEQUENCE vpx_ansfile_seq OWNER TO vc"
/opt/vmware/vpostgres/current/bin/psql -U postgres -d VCDB -c "ALTER SEQUENCE vpx_array_seq OWNER TO vc"
/opt/vmware/vpostgres/current/bin/psql -U postgres -d VCDB -c "ALTER SEQUENCE vpx_binary_data_seq OWNER TO vc"
/opt/vmware/vpostgres/current/bin/psql -U postgres -d VCDB -c "ALTER SEQUENCE vpx_change_tag_seq OWNER TO vc"
/opt/vmware/vpostgres/current/bin/psql -U postgres -d VCDB -c "ALTER SEQUENCE vpx_compliance_status_seq OWNER TO vc"
/opt/vmware/vpostgres/current/bin/psql -U postgres -d VCDB -c "ALTER SEQUENCE vpx_drsrules_seq OWNER TO vc"
/opt/vmware/vpostgres/current/bin/psql -U postgres -d VCDB -c "ALTER SEQUENCE vpx_entity_seq OWNER TO vc"
/opt/vmware/vpostgres/current/bin/psql -U postgres -d VCDB -c "ALTER SEQUENCE vpx_event_seq OWNER TO vc"
/opt/vmware/vpostgres/current/bin/psql -U postgres -d VCDB -c "ALTER SEQUENCE vpx_ext_client_seq OWNER TO vc"
/opt/vmware/vpostgres/current/bin/psql -U postgres -d VCDB -c "ALTER SEQUENCE vpx_ext_server_email_seq OWNER TO vc"
/opt/vmware/vpostgres/current/bin/psql -U postgres -d VCDB -c "ALTER SEQUENCE vpx_ext_server_seq OWNER TO vc"
/opt/vmware/vpostgres/current/bin/psql -U postgres -d VCDB -c "ALTER SEQUENCE vpx_field_def_seq OWNER TO vc"
/opt/vmware/vpostgres/current/bin/psql -U postgres -d VCDB -c "ALTER SEQUENCE vpx_file_system_mount_info_seq OWNER TO vc"
/opt/vmware/vpostgres/current/bin/psql -U postgres -d VCDB -c "ALTER SEQUENCE vpx_host_bus_adapter_seq OWNER TO vc"
/opt/vmware/vpostgres/current/bin/psql -U postgres -d VCDB -c "ALTER SEQUENCE vpx_image_lib_seq OWNER TO vc"
/opt/vmware/vpostgres/current/bin/psql -U postgres -d VCDB -c "ALTER SEQUENCE vpx_ip_pool_seq OWNER TO vc"
/opt/vmware/vpostgres/current/bin/psql -U postgres -d VCDB -c "ALTER SEQUENCE vpx_license_seq OWNER TO vc"
/opt/vmware/vpostgres/current/bin/psql -U postgres -d VCDB -c "ALTER SEQUENCE vpx_profile_seq OWNER TO vc"
/opt/vmware/vpostgres/current/bin/psql -U postgres -d VCDB -c "ALTER SEQUENCE vpx_psa_adapter_seq OWNER TO vc"
/opt/vmware/vpostgres/current/bin/psql -U postgres -d VCDB -c "ALTER SEQUENCE vpx_psa_device_seq OWNER TO vc"
/opt/vmware/vpostgres/current/bin/psql -U postgres -d VCDB -c "ALTER SEQUENCE vpx_psa_path_seq OWNER TO vc"
/opt/vmware/vpostgres/current/bin/psql -U postgres -d VCDB -c "ALTER SEQUENCE vpx_psa_target_seq OWNER TO vc"
/opt/vmware/vpostgres/current/bin/psql -U postgres -d VCDB -c "ALTER SEQUENCE vpx_role_seq OWNER TO vc"
/opt/vmware/vpostgres/current/bin/psql -U postgres -d VCDB -c "ALTER SEQUENCE vpx_sample_seq OWNER TO vc"
/opt/vmware/vpostgres/current/bin/psql -U postgres -d VCDB -c "ALTER SEQUENCE vpx_sample_time1_seq OWNER TO vc"
/opt/vmware/vpostgres/current/bin/psql -U postgres -d VCDB -c "ALTER SEQUENCE vpx_sample_time2_seq OWNER TO vc"
/opt/vmware/vpostgres/current/bin/psql -U postgres -d VCDB -c "ALTER SEQUENCE vpx_sample_time3_seq OWNER TO vc"
/opt/vmware/vpostgres/current/bin/psql -U postgres -d VCDB -c "ALTER SEQUENCE vpx_sample_time4_seq OWNER TO vc"
/opt/vmware/vpostgres/current/bin/psql -U postgres -d VCDB -c "ALTER SEQUENCE vpx_scheduledtask_seq OWNER TO vc"
/opt/vmware/vpostgres/current/bin/psql -U postgres -d VCDB -c "ALTER SEQUENCE vpx_scsi_lun_seq OWNER TO vc"
/opt/vmware/vpostgres/current/bin/psql -U postgres -d VCDB -c "ALTER SEQUENCE vpx_scsilun_descriptor_seq OWNER TO vc"
/opt/vmware/vpostgres/current/bin/psql -U postgres -d VCDB -c "ALTER SEQUENCE vpx_sn_vdevice_backing_rel_seq OWNER TO vc"
/opt/vmware/vpostgres/current/bin/psql -U postgres -d VCDB -c "ALTER SEQUENCE vpx_sn_virtual_device_seq OWNER TO vc"
/opt/vmware/vpostgres/current/bin/psql -U postgres -d VCDB -c "ALTER SEQUENCE vpx_stat_def_seq OWNER TO vc"
/opt/vmware/vpostgres/current/bin/psql -U postgres -d VCDB -c "ALTER SEQUENCE vpx_stat_id_seq OWNER TO vc"
/opt/vmware/vpostgres/current/bin/psql -U postgres -d VCDB -c "ALTER SEQUENCE vpx_tag_seq OWNER TO vc"
/opt/vmware/vpostgres/current/bin/psql -U postgres -d VCDB -c "ALTER SEQUENCE vpx_task_seq OWNER TO vc"
/opt/vmware/vpostgres/current/bin/psql -U postgres -d VCDB -c "ALTER SEQUENCE vpx_template_seq OWNER TO vc"
/opt/vmware/vpostgres/current/bin/psql -U postgres -d VCDB -c "ALTER SEQUENCE vpx_usage_sample_time_seq OWNER TO vc"
/opt/vmware/vpostgres/current/bin/psql -U postgres -d VCDB -c "ALTER SEQUENCE vpx_virtual_device_seq OWNER TO vc"
/opt/vmware/vpostgres/current/bin/psql -U postgres -d VCDB -c "ALTER SEQUENCE vpx_vm_fle_disk_layout_seq OWNER TO vc"
/opt/vmware/vpostgres/current/bin/psql -U postgres -d VCDB -c "ALTER SEQUENCE vpx_vm_fle_snapshot_disk_seq OWNER TO vc"
/opt/vmware/vpostgres/current/bin/psql -U postgres -d VCDB -c "ALTER SEQUENCE vpx_vm_fle_snapshot_layout_seq OWNER TO vc"
The above steps are taken from this thread on the VMware thread: community. https://communities.vmware.com/thread/548057. I have not seen any official KB on this issue. I recommend that you uninstall Update Manager after taking a snapshot of your VUM server, and then removing the plugin from vCenter. I found that VUM often makes your vCenter 6.5 upgrade brick. Now the VUM extension is removed from vCenter, and you have to set it up manually after upgrading. 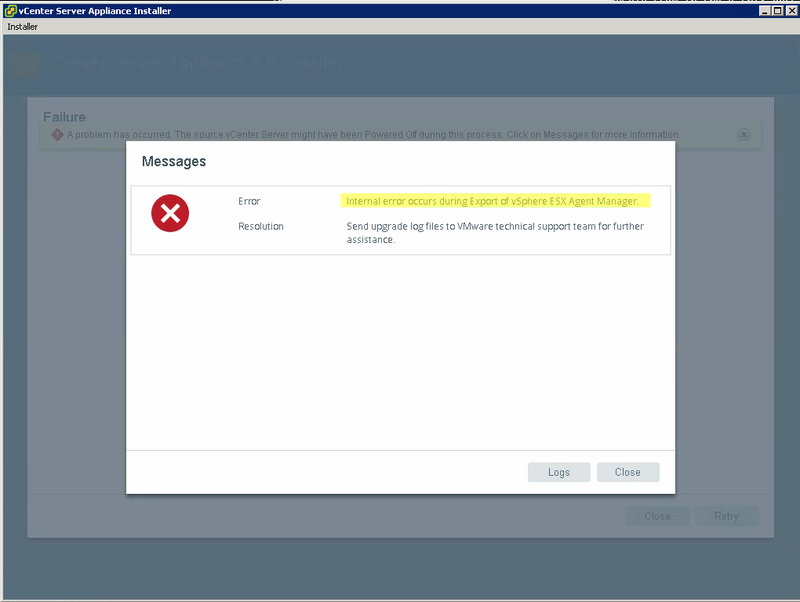 If you get the error: Internal error occurs during Export of vSphere ESX Agent Manager, start by rebooting the old appliance, if that does not work try to remove the com.vmware.vim.eam extension following the same procedure as for VMware Update Manager above, and then reboot your old appliance. Everything at your own risk of course. I have seen a lot of problems when using FQDN and hostnames during the upgrade process, so just use IP. It works! Sometimes the vNIC is disconnected after the new appliance has been deployed. If might be linked with connecting to a single ESXi host instead of a vCenter server, so beware of this, and connect the vNIC manually during the boot process. If you connect directly to an ESXi server you have to update you DRS rules after the VM have been deployed to ensure that it does not move during the upgrade process.